Der Gelbe Raum ist ein Tanz- und Bewegungsraum in der Mariannenstr. 48 in Berlin für Proben, Unterricht und Workshops, stunden und -tageweise zu mieten. Der Raum ist ca. 70 qm groß mit Schwingboden, großer Fensterfront, Teeküche und Toilette. Yogamatten und Decken sind vorhanden. Die Verwaltung wird ehrenamtlich betrieben und verfolgt keinen kommerziellen Zweck. 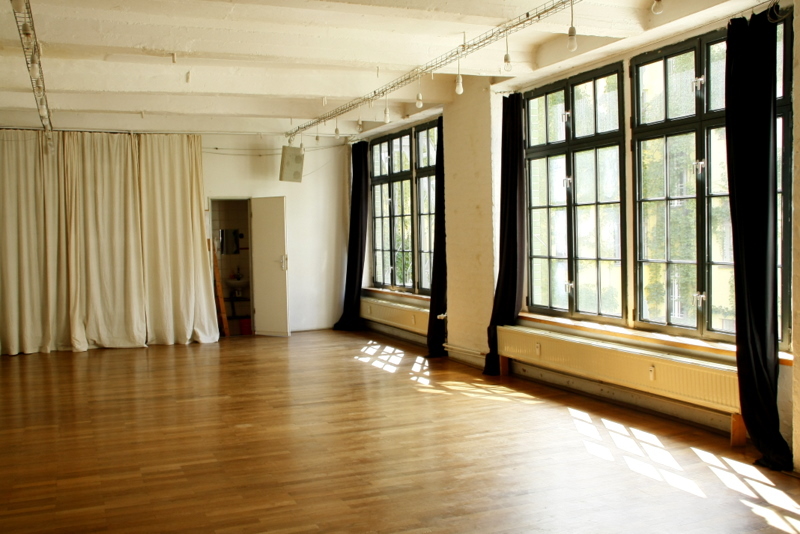 is a bright and beautiful dance/movement studio for rehearsals, workshops, and therapy sessions. We are a non-profit organisation, and our aim is to provide a cheap place for developing creativity and trying out new ideas. Therefore, non-commercial projects will receive a discount. The room is a refurbished 70 m² factory space (it used to be the main „office“ for the Kreuzberg squatting scene in the 1970s). It has swinging wood floors, large windows, a little kitchen, and a toilet.